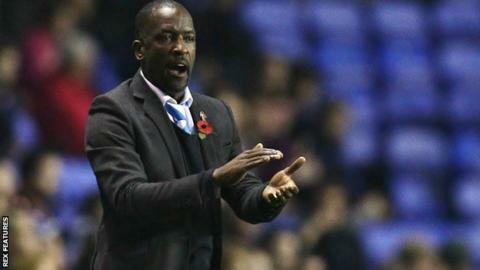 Huddersfield Town have sacked boss Chris Powell after just three league wins this season. The 46-year-old former Charlton boss was appointed Terriers manager in September 2014 and guided them to safety in the Championship last season. However, Tuesday's 2-2 draw at Reading saw them drop to 18th in the table. Town assistant Alex Dyer has also left the club, so academy manager Mark Lillis has been put in temporary charge for the game against Leeds on Saturday. Terriers chief executive Nigel Clibbens said in a statement: "We have decided to make this change after very careful deliberation. "It is made with the long term interests of the club in mind. It signals a change of direction by the club and a new approach. "Chris worked to represent Huddersfield Town to the best of his ability; to develop us, improve us and take us forward. He now leaves us well placed for the future challenges ahead." Powell is the fifth Championship manager to lose his job this season. He gave no indication that he expected the match against the Royals to be his final one in charge of the club. "I suppose when I wake up in the morning it'll feel like a good point but as I stand here now I am disappointed," he told BBC Radio Leeds after the game. "The level of performance was fantastic when you look at the fact we had two players making their first league starts."